There is currently a shortage of teachers in the Numazu / Mishima / Fuji / Fujinomiya area. I made myself available to do some overtime shifts to make a little extra money, however schools in my area were cutting costs and were told not to allow any overtime. Since I had nothing else going on, I decided to go to the Tokyo area to find something fun to do. My first stop was my old neighbourhood. I got a haircut from the really good barber near Shinyurigaoka station, and then stopped by a bank to send some money home. Thanks to advice from other teachers, I got a Lloyd’s account which allows me to transfer money from my SMBC Japanese bank account to my Canadian bank account with a flat transaction fee. The best part is that I can do this transfer from any SMBC bank machine. I need to send money home periodically to make sure that my student loans are being paid, and it also prevents me from overspending. Like other teachers, I try to watch the exchange rates and do my transfers when the forex is favourable. After sending money home, I treated myself to Wendy’s for lunch. I then headed off to Shinjuku to buy some books at Kinokuniya. I love Kinokuniya – it is probably the best book store in the country. I was going to be productive and do some clothes shopping, but decided that since I had already been somewhat productive (getting up early, haircut, money transfer), that I should do something fun. I ended up heading to Yokohama to see a movie. This was my first time going to a movie theater by myself. It felt strange to go solo, which is a bit funny when you consider that you really aren’t supposed to talk to people in the theater anyway. I bought a ticket for Million Dollar Baby and then killed some time playing video games at a nearby game center while I waited for the movie to start. 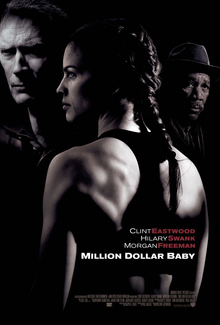 Million Dollar Baby is simply a fantastic movie, although it probably caught a lot of people off guard because it is marketed as one kind of movie and then half way through becomes something completely and totally different. No, I am not going to give any spoilers. I really enjoyed the experience, but would have liked someone to talk about the movie with after it ended. After the movie I got a quick bite to eat, and then proceeded to drag my giant, heavy bag of new books through a few train stations on my way home. It’s great living so close to the Greater Tokyo area! This entry was posted on June 7, 2015, 8:00 pm and is filed under Greater Tokyo Area, Life in Japan, Movies, Yokohama. You can follow any responses to this entry through RSS 2.0. You can leave a response, or trackback from your own site.